There was a quiet tenacity about Mike Ford prior to Friday evening’s pivotal clash against Saracens at The Rec. Asked how Bath would combat their opponents’ famed rush defence, he simply explained his charges would need to meet fire with fire as close to the gain-line as possible. It was a straightforward, uncomplicated assessment. In fact, Ford senior has been instilled with calm for most of this season. Perhaps it is the comfort of knowing blockbuster behemoth Sam Burgess is soon arriving in the West Country. More likely, it is that his squad seems settled and reinforced with renewed steel. Following a 31-24 defeat to champions Northampton Saints last week, there was little panic or regret. Instead, Bath’s head coach suggested staunch “belief” – no-nonsense determination – would be required. Sure enough, after an edgy opening against Saracens, the hosts adopted a hard edge to face last season’s runners-up. George Ford, Kyle Eastmond, Jonathan Joseph and the magnificent Semesa Rokoduguni sparkled, but it was physicality and industry up front that eventually bullied Bath to victory. Mirroring the Saracens way, success was built on aggressive accuracy in defence. Bath made 151 tackles in total, missing just 18. Uncharacteristically, Paul Gustard’s men missed 33, executing 91. The rope-a-dopers got rope-a-doped. At the heart of this rugged spoiling effort was the immense Dave Attwood. He presented an awkward obstacle to Saracens’ progress all night. It was the kind of brawny, bristling display that makes Graham Rowntree grin. Above most things, he wants his forwards versed in the old-fashioned, less-heralded art of being unpleasant to play against. Lock is a mighty strong area for England. Joe Launchbury and Courtney Lawes established themselves as a world-class pairing over the recent Six Nations. Geoff Parling stepped up brilliantly in New Zealand. Ed Slater, George Kruis and age-group rockstar Maro Itoje could easily thrive as well. However, Attwood’s consistency has been fantastic since winning selection for England’s tour to South America in the summer of 2013. Though mainly restricted to cameo replacement appearances in Test matches, he has always brought spike and spite – valuable commodities. These clips demonstrate how he helped blunt the Saracens battering ram. The early stages of a rugby match at any level take on a hugely significant psychological dimension. How often do you hear coaches bark about the importance of every player’s first tackle? On Friday, Attwood spent the opening seven minutes chopping down Saracens’ most effective runners. Watch this challenge on Kruis. 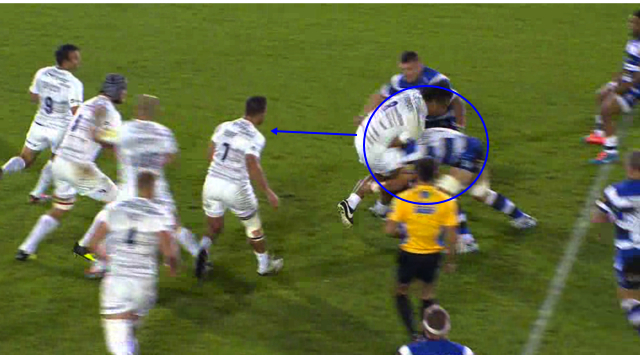 With pacey line-speed (a constant theme of his performance), Attwood reaches Kruis behind the gain-line. He stays high for this tackle, trusting his upper-body strength to stand firm. This aids Bath in two ways. 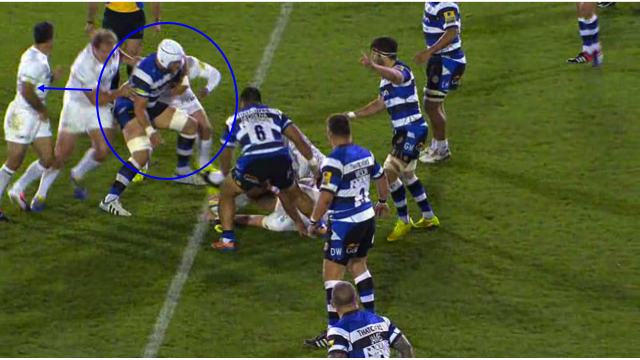 Firstly, it stops Kruis from offloading – as the moment of impact shows. 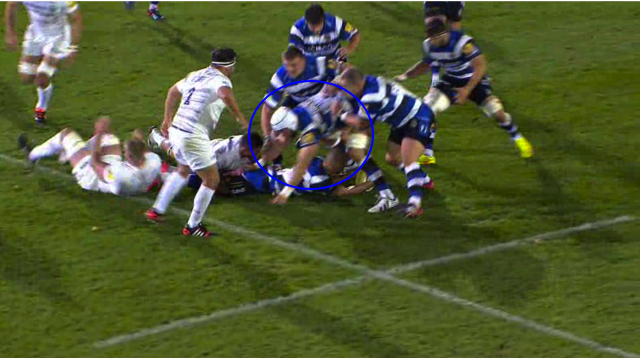 Secondly, it allows Attwood (circled in blue) to stay on his feet as the tackle is completed. This way, he can be a nuisance at the ensuing breakdown, working towards the Saracens try-line and impeding Kruis’ support. 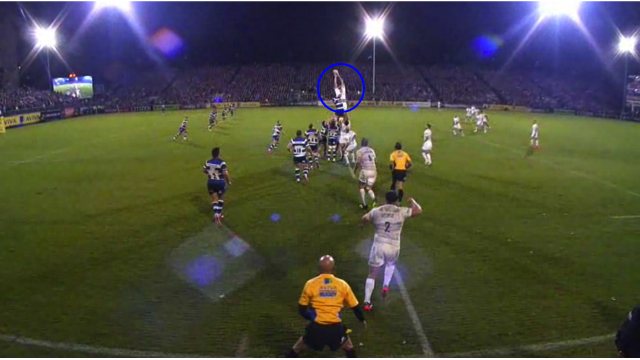 This action is illegal, though not obvious enough to be picked up by referee Greg Garner – a wonderfully irritating piece of forward play that slows down Saracens ball markedly. The next clip is longer, hopefully giving a decent idea of Attwood’s industry and athleticism. Track him as Charlie Hodgson’s penalty attempt strikes the upright. Here, Attwood fills and intriguing passage of around 20 seconds with good decision-making and graft, culminating in an excellent offensive tackle on Billy Vunipola – a truly talismanic carrier. Before anything else though, his first concern is retaining possession for Bath. As winger Olly Woodburn latches onto the ricochet, watch how Attwood secures position from the ensuing ruck. His support line is very tight and his body position extremely low, so much so that it could be argued he isn’t supporting his own bodyweight. He again gets away scot-free and can chase Chris Cook’s clearance a phase later, where he meets Vunipola. A great deal surrounding the concept of ‘winning collisions’ is to do with mind-set. Technique also helps, though. 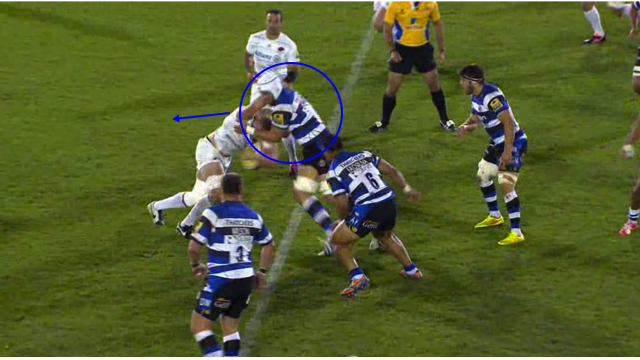 Attwood gives away nine kilograms or so to Vunipola, but makes up for this by accelerating into contact, grabbing a leg to unbalance his opponent and driving through the target. It is an outstanding effort. We move into the second half now. Bath have forged an 18-6 lead and Saracens are on the attack looking to reduce the deficit. Attwood offered ballast in the scrum all game, but here is a concrete example of his six foot, seven-inch frame causing problems at the lineout too. Stationed 25 metres out, Saracens have positioned Vunipola in midfield and are clearly looking for quick ball from the tail. However, Jamie George is clearly wary of Attwood and sends his throw slightly too high for Alistair Hargreaves. Despite not managing a clean steal, Attwood does enough to cause Hargreaves to spill. Once more, Saracens must attack from slow ball opposite a Bath defence that is set – all because of their lock’s troublemaking. A try from Chris Wyles brought the score to 18-11 and Mark McCall’s side looked intent on snatching an unlikely draw at least. Any weakness on Bath’s part, mental or physical, could have led to defeat. This clip, encompassing four phases of Saracens attack, shows how Attwood continued to inspire. In the age of accessible analysis, statistics are a big commodity – tackle-counts normally high on the agenda. Attwood made 13 during this match, but it was the quality as well as the quantity that made his role pivotal. While two challenges in four phases is impressive in itself, the fact that both are made around five metres behind the gain-line – with over an hour gone in the game – defines Attwood’s influence. If Bath are to challenge for domestic glory, they absolutely need their lock to keep delivering the spiky, subtle touches that make opponents uncomfortable. Thanks to BT Sport for footage of this match. Not a member? Start a free 3-day trial to access all 60 video courses and learn from the world’s best rugby minds. The Barbarians come together from all corners of the globe to socialise and cobble together a loose strategy – with strictly equal emphasis. When they perform as they did this weekend, running in five fabulous tries past the Wallabies, the legendary invitational side encourages smiles around the world. Though Sir John Kirwan’s charges went down 40-36, they will have stirred youngsters everywhere to shake off shackles and try things – a fantastic legacy. Adaptability and opportunism are pivotally important tools for sporting success. And rugby is no different. In fact, the disruptive weather conditions of a northern hemisphere winter – always cold, often wet – place heightened emphasis on these inherent qualities. Scarlets’ victory over Leicester Tigers on Saturday gave us a perfect example of a side ‘winning ugly’. On Saturday in the Aviva Premiership against Gloucester, Danny Cipriani brilliantly manufactured three scores in the opening 40 minutes. Then, much later in the contest, he scythed through to land his side’s fourth for good measure. These video clips and screenshots demonstrate how his instinctive attacking excellence caused havoc.